–Stranger Than Fiction Presents: Christmas at Hogwarts! At The Seacoast Rep (8:00 – 10:00). 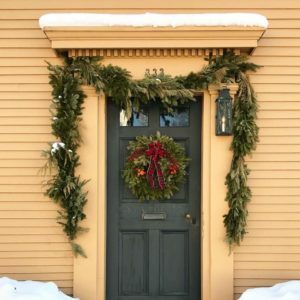 –Annual Holiday Open House at Exeter Historical Society (6:30 – 8:00). –Drop-In Yoga Class at WSCA Radio (7:00 – 8:00). –Gingerbread House Decorating at Kittery Community Center (5:30 – 7:00). –Ann Hood with Michael Ruhlman at The Music Hall Loft (7:00 – 8:00). –Watercolor & Wine paint Night at The Central Bean and Bakery (6:00 – 8:00). –Drop-In Ukelele Circle Jam at Stoneface Brewing (7:00 – 8:00). –Women of the World featuring Chef Cara Stadler at Black Trumpet (5:00). –Vias & 1652 Wine Dinner at 1652 (6:00 – 9:00). –Coastal Connections Holiday Social at Profile Coffee Bar (6:00 – 9:00). –The Halftime Show feat. James Gilmore at Tributary Brewing Co. (5:30 – 7:00). –Winter Benefit Party at Old Vines Wine Bar (5:00 – 9:00). –TedXPortsmouthWomen 2018: Showing Up at 3S Artspace (4:00 – 8:30). –Complimentary Massage with Knead to Run Massage at Runner’s Alley (6:30 – 7:30). –Annie at The Seacoast Rep (7:30 – 10:00). –Hope on Haven Hill Lighting the Way Gala at Wentworth By the Sea (6:00 – 10:30). –Wyland & Valley at The Press Room (8:00 – 11:00). –Rep & Ride at CycleFierce (6:00 – 8:00). –Open Improv Jam at Kittery Community Center (7:00 – 9:00). –Time to Write at The Word Barn Exeter (7:00 – 9:00). –Know Fish Dinner at Vida Cantina (6:00 – 8:00). –King Kyote with Troy Ramey at The Press Room (9:00). –Holiday Expo at The Art Center Dover (4:00 – 8:00). –The Blizzard of Aahhh’s at 3S Artspace (7:30 – 10:00). –Miracle on 34th Street: A Live Musical at the Historic Town Hall Theatre (7:00 – 9:00). –Christmas Prelude: Fireworks Viewing at Kennebunkport Inn (6:00 – 7:00). –Mistletoe Magic Market at Sage Farm Antiques (10:00 – 1:00). –Wizards Ball at The Portsmouth Public Library (6:00 – 9:00). –Con Tutti! at South Church (7:30). –Cutting Board Workshop at Port City Makerspace (10:00 – 12:00). –Winter’s Farmers Market at Exeter High School (10:00 – 2:00). –Winter’s Farmers Market at Rolling Green Nursery (10:00 – 2:00). –Miracle on 34th Street: A Live Musical at the Historic Town Hall Theatre (1:00, 7:00). –Thanks to Gravity at 3S Artspace (8:00). –Gentle Temper & Lily Bird at Book & Bar (7:00 – 10:00). –Whym & Prost Present: Holiday Party 2018 at Whym Craft Beer Cafe (6:00 – 11:00). –The Evolution of Christmas at Gov. John Langdon House (1:00 – 2:30). –Paint & Sip at LaBelle Winery Portsmouth (2:00 – 4:00). –Parsonfield at 3S Artspace (7:00 – 10:00). –Sunday Night Jazz ft. Chris Klaxton at The Press Room (6:00). –Elf The Musical at The Music Hall (12:00, 4:30). –Visit with Santa at Churchill’s Garden Center (11:00 – 1:00).